Gauge...yeah...it's such a funny thing. Knitters the world over have such a love/hate relationship with it. Or at least I have a love/hate relationship with it. You can get a group of knitters together and bring up the topic and you can have a debate that could last for hours. Google "knitting + gauge" and you'll get endless websites about the topic (my favourites are are by Knitty and Twist Collective, very informative!). The Yarn Harlot has written several blog posts and has sections in her books dedicated to gauge and swatching. Actually, my most absolute favourite and (in my opinion) most awesome post is this one, that people now quote her on quite regularly. Some knitters laugh in the face of swatching while others are strict and unyielding. Some knitters claim to never swatch (remember this hilarious video by WEBS? ), some can't cast on a project without swatching first, but most are selective swatchers. What camp do you belong in? Trust me, I won't judge. I'm not here to guilt trip anyone and I'm definitely not here to lecture or to tell you how to swatch. Although, if you do want to know how to swatch and do it properly I've heard nothing but good things about Singlehanded Knits' e-course, Swatch Like You Mean It. So what camp do I fit into? Well...I wish I could lie and say that I swatch every single time, that I knit my swatches a nice big 6" square complete with garter stitch borders (or the completely in the round, if the pattern is knit in the round), and that I even mark out the 4"x4" gauge area, wash, and block the swatch too. But I can't lie. So I'll say that I'm a little of this and a little of that - as in sometimes I swatch, and sometimes I don't. Sometimes I block my swatch, sometimes I don't. I don't think I've ever knit a garter stitch border on any of my swatches and I know for a fact that I've never marked off any kind of area. Sometimes I knit large swatches, sometimes I do small ones (gasp!). Sometimes, I don't block my swatch (double gasp!). And you know what? I'll even admit it: sometimes I don't swatch at all (the horror!! Someone just fainted at this statement). But before I get a million emails and messages telling me what a horrible knitter I am, that you're going to stop reading the blog, and that I'm being an irresponsible knit blogger by not knitting "by the rules", let me tell you my reasonings. Please note: I'm not saying that you should do it my way, or that this is how you do it properly. For all I know, I'm swatching completely wrong. But so far, it's been working for me and everything I've knit myself has fit and/or worked up to my liking. And that's what counts. Judge all you want, but here's why I sometimes swatch and sometimes I don't. I don't knit gauge swatches for socks. To me, the first sock is already a gauge swatch. No, seriously. When I think about it, it would probably take the same amount of time to knit a gauge swatch in the round as it would to knit a toe or the cuff. I've knit enough socks to roughly know what my gauge is and what my preferences are, such as I prefer the fabric I get from knitting my socks at 64 stitches on a size 2.25mm (US 1) needle. If the pattern calls for more or less stitches, I look to see if the fabric of the design is one that provides stretch or not, and from there I go up or down a needle size. But really, I have no problem with starting a sock, knitting half a foot, and then frogging if the sock doesn't fit to my liking. I find knitting to be so personal that really, even if you achieve the recommended gauge given in a sock pattern, that doesn't necessarily mean the sock will fit. Most sock patterns that I've seen offer either 1 or 2 "sizes", and as we all know, feet come in such a huge array of shapes and sizes. Am I right? So to me, it's pointless to knit a gauge swatch for socks. I generally don't knit swatches for any of these items either. Unless there's a crazy stitch pattern that I'm completely unsure about, or if getting gauge is a must for the design to work out correctly. Yes, I'm fully aware that by not doing a gauge swatch that I could potentially screw myself over yardage wise, and I take complete responsibility for that. I always make sure that I have enough yarn and a bit, and I actually don't mind the occasional game of yardage chicken when I start knitting a shawl/scarf/cowl. Cause you know, I like to live dangerously from time to time. I also completely understand that by not knitting a gauge swatch and not knowing ahead of time what my gauge is, that my final knit may be smaller or bigger than what the pattern intended. And I'm ok with that. As long as I like it and can wear it, then it's all good in my books. Although sometimes a designer will state in their pattern (or at least we hope they all do!) that they used up every last inch of yarn and/or that they also frogged the gauge swatch and used the yarn from that too, then I might consider knitting a swatch - especially if I'm knitting from stash. I like to think that I have a good general idea of what my tension is like when it comes to certain combinations of yarns/fibres, weights, and needle sizes, and always take into consideration the design elements of a pattern. For instance, if the accessory is suppose to be super drape-y, if there's a lot of cable work, if it's all garter stitch, etc, then I'll adjust my needle size as necessary because I know my garter tends to be on the tight side and sometimes I pull my yarn a bit too much when working a yarn-over. And if all else fails, there's nothing that a little aggressive blocking won't fix! Come on, don't tell me you don't tend to aggressively block your lace shawls too! I don't swatch for gloves or mittens for the same reason as socks. What's the point? At least with gloves and mittens you don't have to worry about turning a heel and they're generally always knit from the arm up with the thumbs and fingers usually knit last. By the time you reach these points, if you can't tell if the glove or mitten doesn't fit, well...you're just in knitter's denial! But then again, who hasn't been there before?? Guess what? I don't swatch for hats either. You're all probably thinking I'm either the worst or the laziest knitter in the world. Or both. But I just don't knit gauge swatches for hats. Like with socks, gloves, and mittens, I think it would take the same amount of time to knit a swatch as it would the beginnings of a hat. I have a pretty big noggin that's oddly shaped (re: I think my forehead could match that of Christina Ricci's) and so I'm a little particular when it comes to hats in general, especially when it comes to brim width and slouchiness (usually it's not slouchy enough and it just ends up looking ill-fitting). When I knit for the Munchkin I tend to just hope for the best and like to think that maybe he can grow into it (although he's got a pretty big lollipop head too), and as for the Mister, well he's got a massive Fido Dido shaped head and either have to go with the biggest size available or be conscious with my tension and hope it fits. If not, then the Munchkin can grow into it! Not really scientific, but oh well. Ok, after admitting that I don't or rarely knit gauge swatches for pretty much every type of accessory out there, here's something that I do knit swatches for: cardigans and pullovers. When it comes to a knitted item that you wear and fit is absolutely key in making sure it looks good, I'll swatch. Ok fine, most of the time. Sometimes it'll be a full blown 6" square or larger (sans garter border though) that I'll even wash and block. Sometimes I'll knit a sleeve. Sometimes I'll knit a pocket. Once I've even knit a section that would have been the same size and would have taken the same amount of time to knit, as a swatch. 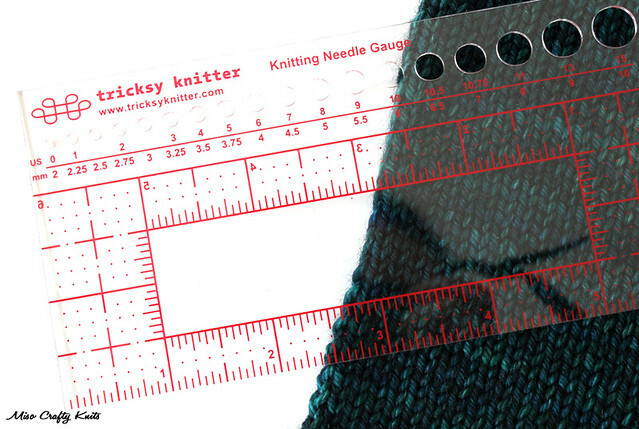 Regardless of how it's knit, I'll take my measurements from different areas to see if my gauge is consistent. Even as I knit the actual garment, I'll stop from time to time and measure my gauge to make sure I'm still on track from when I started. And when I measure, I do it two ways: first I measure how many stitches I get per inch and write it down. Then I measure how many stitches I get in 4 inches and write it down. I multiply my stitches that I counted from the inch measurement to see if I get the same amount as I had counted for the 4 inches. Do they match up? Then I check out the pattern's gauge (which I would have done the math for before casting on) and compare it with that. Sometimes my gauge will be off on the inch measurement compared to the pattern, but would still be dead on for the full 4 inch measurement. Weirdness. If there's a stitch design in the pattern, I'll swatch that too. I find most of the time I'll have to go up or down a needle size. If there's garter in the design somewhere, I won't swatch for it. I already know that I'll need to go down a needle size, especially if mixed with stockinette, as garter tends to be wider and somewhat bulkier looking than stockinette. I think garter cuffs and hems just look nicer when it's balanced with the stockinette and isn't bulging out. So going down a needle size is something I always do, regardless if it says to do so in the pattern or not. I'll also swatch for sure if I'm going to knit with a yarn and/or fibre that I've never worked with before, like the delicious wool/angora/camel/cashmere blend that I used for my Windswept pullover. Cause you just don't know how a fibre will act once you wash and block it. Will it bloom a ton? Will it stretch like a mofo? Sometimes a swatch won't tell me everything that could potentially happen (darn you swatch!) but it's better to know one or two things than being completely in the dark. If a pattern is nothing but stockinette though and I'm using a yarn I'm well acquainted with...I'll downright admit that sometimes I just won't swatch at all. I'll take note of what the gauge is for the pattern, cross reference it with a past project, and go with what I have used before. Call it lazy knitting, call it smart knitting, call it stupid knitting. So far it hasn't backfired on me yet and garments have worked out. So there you have it. In full writing. What I swatch for and what I don't swatch for, and my reasonings behind it. I'm sure some of you are still giving me the side-eye over the Internet, wagging your finger and clicking your tongue at me, but whatever. This all works for me and I take full responsibility for the consequences for when I don't swatch. Knitting is so personal and customizable that to me, as long as the end product comes out looking and fitting right, what's the problem if a knitter did or did not swatch? When you see a beautiful hand knitted item, the first thing that you think of isn't "omg, did she swatch for that??". Or, at least I hope it isn't! On that note, how and when do you swatch? Oh! 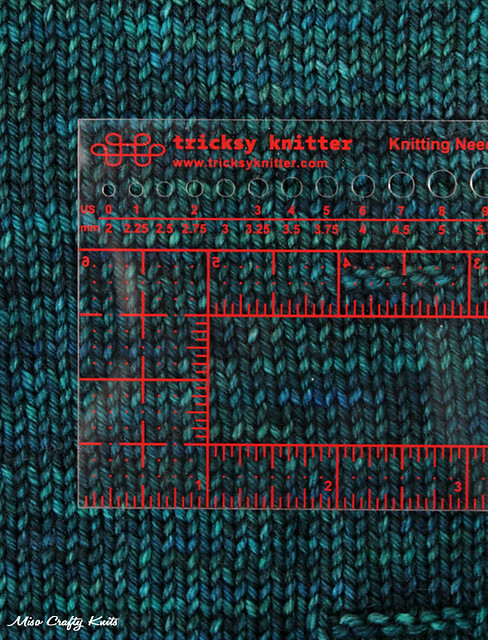 And this is the perfect opportunity to say thank you to everyone who entered my impromptu giveaway for the Tricksy Knitter Knitting Gauge. I loved reading everyone's comments and had a good laugh on a few (cause it was either my thoughts exactly or what I do too!). I also loved that everyone was straight up with how they take their gauge measurements. There's no judgement here! Sanjou, sorry, I believe it's been a little over 48 hours but I'll be contacting you today to get your mailing address!! YAY!!! Oooh, what is colour/yarn is that lovely blue/green swatch? It's Madelinetosh Tosh DK. I believe the colourway is Cousteau. Sorry, I had knit this swatch a while ago and lost the little tags that I like to keep with my swatches! Thank you so much! 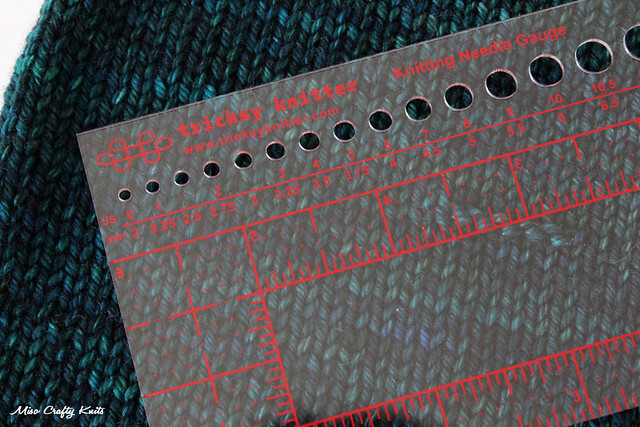 I'm really looking forward to the knitting gauge! It'll definitely help when my swatches are trying to curl up on me while I measure them out! Personally, I only swatch for larger items where fit actually matters (sweaters, shirts, dresses, etc.). All of my shawls, gloves, and socks have, so far, turned out beautifully based on complete guesswork and a heavy hand during the blocking stage at times. Haha, oh Fido Dido. :p That's the only head shape description I can think of when it comes to the size of the Mister's head!